PO BOX 714, Moonah, Tas. 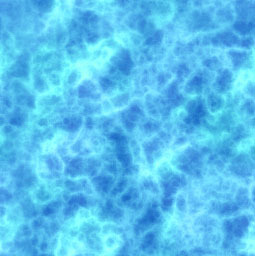 7009. President; Brett Price, Phone 0408720130. The Beautiful Firetail is a species of Estrildid finch found in Australia. 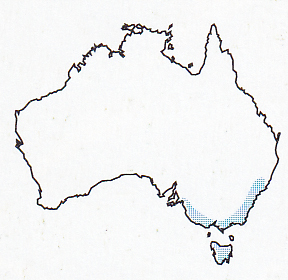 The only members of that group found in Tasmania. It is 10 to 13 cm long and weighs 14g. 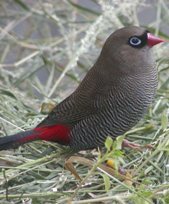 The Beautiful firetail is a small bird, slightly smaller than a Diamond firetail. The plumage is mostly dark olive-brown, covered in fine darker-brown barring. Its rump is a dark crimson red. The tail brown with widely spaced darker bars. It has a distinctive black face mask from eye to red beak. Pale blue eye ring. The underparts are finely barred in black and white. Endemic to South-eastern Australia (the only Estrildid finch found in Tasmania). Its range extends from Newcastle to Kangaroo Island and Tasmania where it is most prolific. It lives in coastal heathland, shrubbery and forests, but never far from running water.